From left to right: Nasir Baig, Moin-Ud-Din, Mereid Wale, Nazim Goraya, Kamala Karki, Angad Singh, Gulshan Allibhai (owner), Aamer Kantawala, Gurpreet Mahi, Abul Hossain, Kottill Nair, Hitesh Arora, Rafik Patel and Abdul Jabbar. Lahore Tikka House was founded in 1996 by the late Alnoor Sayani. It began as a modest business with a few tables and chairs and steadily grew into a 400 seat restaurant that is a Toronto landmark. 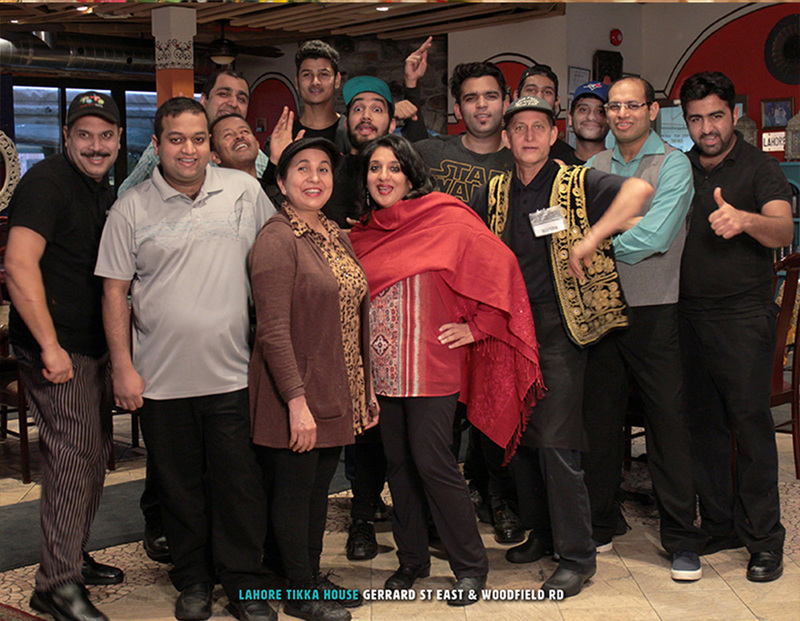 Sayani was loved and deeply respected for his passionate vision to unite the community of the Gerrard India Bazaar, bringing together all cultures, religions and races within his restaurant. To learn more about Sayani go here. Lahore Tikka House is now run by Gulshan Allibhai, (Alnoor Sayani’s wife) who left her job as a teacher at Ryerson and Laurier and a social worker at The Canadian Mental Health Association in order to run the restaurant after her husband’s passing. Lahore Tikka House has a diverse staff of up to 75-80 people in the summertime. It is a cornerstone of the Gerrard India Bazaar and the Lahori cuisine is delicious!